No, I'm only on a small sugar rush from the Christmas baking I've been eating. But there was a question on Facebook and it triggered such a familiar debate that I figured it's time for a write-up. The question was about greetings and sure enough, someone mentioned feasgair math and a bit further on it got slated for non-Gaelic idiom. Emotions aside, it's an interesting question, so let's see if we can shed any light on the headache. Virtually all textbooks and phrase books from the turn of the century will give you madainn mhath and feasgair math for good morning and good afternoon. There's also oidhche mhath but, curiously, that one does not seem to get the blood boiling. I'll sidestep the question about whether there's any point to that much praying but, anyway, the Latin names of some of these time units were borrowed into Irish and Gaelic. Matins became madainn or maidinn (maidin, in Irish), the None became nòin or tràth-nòin (iarnóin for afternoon and tráthnóna for evening, in Irish), and Vespers became feasgar (though rare, in Irish, feascar in the common sense of the word and easparta in the religious sense). These were borrowed so long ago that the p became a c/g. Now, this is where it gets tricky because we don't really have much evidence of these being used in greetings. Part of that is a lack of colloquial texts in the older material. However, in texts from the 1800s, we do have instances of the still ubiquitous Irish greeting, Dia dhuit, God be with you. It is certainly conceivable that in pre-Reformation Gaelic speaking Scotland this phrase was also in common use but that's just an educated guess. Either way, it has not been heard much in Gaelic Scotland for at least a century, otherwise it would have found its way into some of the older phrase books and dictionaries. ... shaoil i gur e duine nàdarra a bh' ann agus thuirt i "Tha oidhche mhath ann". This bring us to the other part of the problem - the historic decline in speaker numbers through genocide (you know, dispossession, forced emigration, economic deprivation and forced anglicisation via the education system). 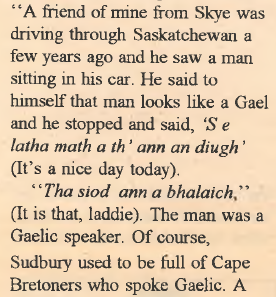 These circumstances resulted in a society where you could no longer assume that a stranger you met was Gaelic speaking and consequently you would not commonly address them in Gaelic, but in English. Relatively old but given that Gaels have written things down since the 6th century, it's so novel the paint is hardly dry. Like calling a word that was first used in Windows 3.1 "ancient". We will probably never know exactly who came up with madainn mhath and feasgar math but they're certainly here to stay. They just jar a bit with some older native speakers. With a native speaker, my personal solution to the headache is to move off madainn mhath and feasgar math as soon as I know their name. Using their name in the vocative, followed by a variety of introductory questions such as dè do chor/ur cor, ciamar a tha thu/sibh, and so on, seems to go down relatively well. Sin thu/sibh or the more colloquial shin thu also works. That way, personally, I haven't had the madainn mhath debate in years. Alternatively, you can take the standpoint that there are enough people, including native speakers, for whom madainn mhath and feasgar math are perfectly natural Gaelic today and that whatever may have been the case once no longer applies today. Which is also a perfectly permissible approach - just be prepared for an argument from some quarters! In this spirit, I bid you all oidhche mhath. Air a tharraing à "http://akerbeltz.org/index.php?title=Feasgar_math_or_how_to_start_an_argument&oldid=4001"
Chaidh an duilleag seo a dheasachadh 5 dhen Dàmhair 2017 aig 14:47 turas mu dheireadh.